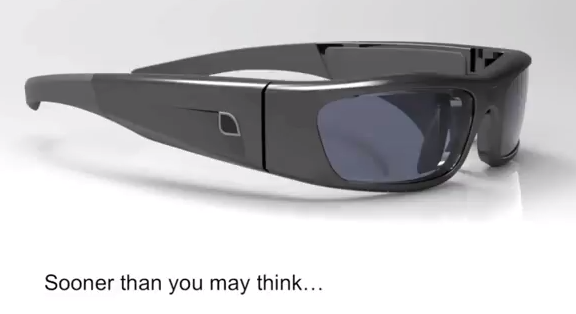 Brother's AiRScouter see-through head mounted display is coming out this fall? One thing's for sure, they Brother stresses the AR use cases of that device. The future of firefighting may be augmented according to Tanagram. As Toby points out, a firefighter wants 100% reliability which doesn't go well with computer vision dependence on heuristic algorithms. Lovely design concept - Fujitsu Iris - the transparent tablet which "amplifies reality". And this may be the most innovative use of QR codes in an ad campaign ever - reveal the secrets of Victoria's Secret girls. In the last week Bruce Sterling has posted several demo videos of AR projects done by Art Center College of Design (Pasadena) students. The class, which is sponsored by Layar (very wise move!) and guided by Sterling, resulted with some interesting ideas, from AR religion to Bitcoin treasure hunt, but I liked most Dobu Dobu, an "augmented reality app to create love, companionship and friendship through adoption of virtual pets". Well, I guess the title says it all. Leaf++ is the brain child of Italian artist Salvatore Iaconesi that couples together visual search and social networks to augment (you guessed it) leaves. A user can leave (no pun intended) a message on a leaf, to be seen later by other users scanning the same leaf type. Watching the above video, it seems that some people get high on leaves. More details can be found on Iaconesi's site. 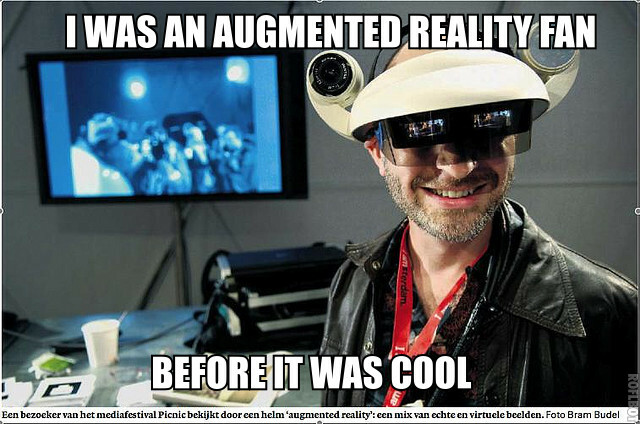 Osterhout's Amazing HUD: Dreamware or Vaporware? A few months ago Ralph Osterhout had a chance to present his vision for the future of HUDs at the e.g. conference. If you had to some his vision into one word it would be amazing. The list of features is endless, from night vision to high definition 3d display. Even more amazing, Osterhout claims that a militarized version of this HUD would be available this summer, and a consumer product will come "sooner than what you may think". I'm a bit sleepy today, so please excuse any increase in grammar mistakes. The augmented reality Korean unification project is an interesting little art/political project leveraging the power of erasAR. What other sights would you like to erase using augmented reality? Congrats to the guys at Zugara for being the first (afaik) AR clothing application provider to fully integrate with their product with a retailer's website: Banana Flame puts Zugara's Webcam Social Shopper app on every product page. iOS based Gakufu Camera scans printed music notes and play them in real time. ISMAR 2011 AR tracking competition is now open for registration! QR Hobo Codes, for those hobos carrying a smartphone (via @bruces). before I fall to sleep, here's a very short video illustrating Minecraft brought to the real world using augmented reality (more specifically, using Kudan's Qoncept engine). I watched this talk by Kevin Slavin at Mobile Monday Amsterdam three times already (which explains why it took me so long to post it here), and I still can't understand what are his issues with augmented reality. One claim is obvious, and I tend to agree, that immersion is neither necessary nor sufficient for an exciting experience. His other claims may be confusing (or misdirected), yet Slavin is a master of weaving together anecdotes from history and his own personal life into a compelling story, which makes the following video interesting to watch. And since it's pretty big news (and Layar is a darling of the tech press) you probably already read about it somewhere else. Android Beta version is coming in a few weeks. iPhone and Android full versions are coming by the end of Q3. Seems like a "basic" (nothing is basic in this field) image recognition and tracking. Image recognition is done on the device, so augmentation should be relatively snappy. They are going to charge money for this, unless your layer gets less than 1000 matches per month, or if it's a non-profit, artistic or educational layer and the powers to be like it enough. Pricing seems really fair to me. You can win up to $15K by creating a vision based layer. I think the "share it now" button has a potential to become a huge hit (think Instagram). What do you think? Update - misunderstood the documentation. You can have different augmentations depending on both location and image.